My little girl loves to change clothes many times. She is in the stage where she is curious. She wants to look at the mirror and look at herself with that outfit. 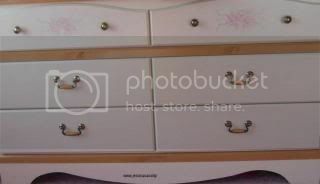 She has two sets of pink drawers in her bedroom. One is big and one is upright. She puts all her clothes mostly in the upright where she can reach and open the drawers. She is in hurry sometimes that the drawer is hanging down. I told her to open her drawers carefully and make sure it close too. I do not want her to get hurt. She does play with her drawers. I will tell my husband to buy a different kind of drawer slides that will keep her drawer safe. She has these sets of drawers and cabinets when I was pregnant with her. Are you looking for something that will keep your little girls drawer safe? Why not check out this Website? They sell different kind of tools and accessories that will keep your little girl safe. I really like this kind. It is my favorite.